A new soil treatment technology and promising alternative to soil fumigation. We take food processing waste streams, such as tomato pomace or almond shells, and add them to the soil, then place a tarp over the field. As the temperature of the soil rises under the tarp, certain thermophilic microbes in the soil begin to thrive, and consume the amendment. The combination of solar heating and accumulation of metabolic by-products of these microbes, such as volatile fatty acids, can help to control or eradicate many plant pests. Our work has demonstrated effectiveness against nematodes, weeds, and bacterial and fungal pathogens. Production of gaseous biofuels using anaerobic digestion can offer combined waste management and renewable energy generation in food processing facilities. Our work investigates how digester microbial communities respond ecologically to various stresses, such as low moisture content, varied feedstocks, and inhibitor contamination. Ultimately, this knowledge will be used to design digester communities with improved functionality and stability. Releasing fermentable sugars from lignocellulosic food processing residues is a major hurdle to their use as biofuel feedstocks. Our research investigates methods to effectively deconstruct lignocellulosic food processing into substrates that are compatible with existing biofuel fermentation pipelines. This includes pretreatment of food processing residues, such as ionic liquid pretreatment to disrupt their lignocellulose structure and improve digestibility to fermentable sugars. Moreover, we probe natural microbial communities to discover microorganisms that produce enzymes that a particularly effective in breaking down lignocellulose in food processing residues. Our lab has developed methods for two-step valorization of food processing residues, such as tomato and red grape pomace - the skins and seeds of tomato and red wine grapes, respectively, that are leftover after processing. 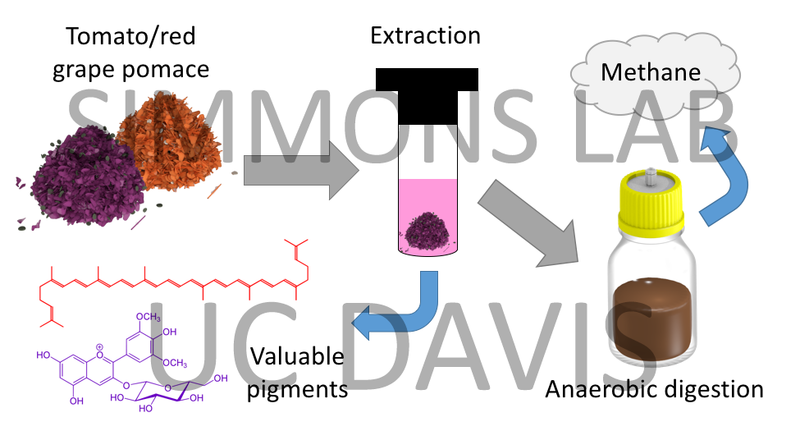 These residues contain valuable pigments that can be used as food colorants or antioxidants. By extracting these pigments, then channeling the solid residues left behind to biofuel production, our work has developed a process that creates both high value end products and a source of sustainable fuel. Food processing generates many organic compound-rich wastewater streams. 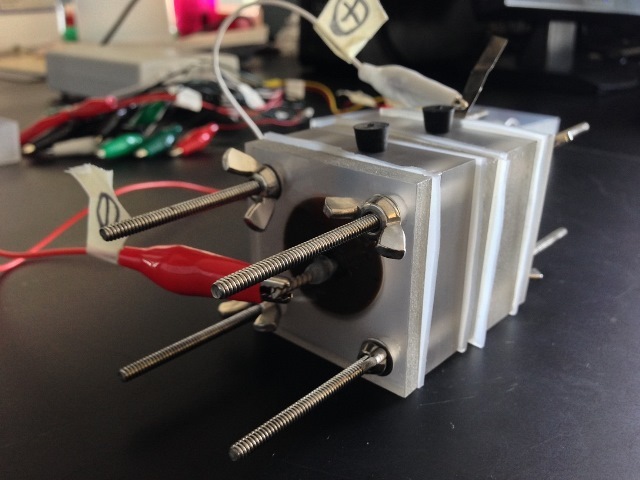 Bacteria can oxidize these waste-derived organic compounds generate electricity in the process via microbial fuel cells. Applications include sustainable wastewater solutions for the dairy, fruit, and vegetable processors of California. Our work seeks to improve the performance of microbial fuel cells using food processing waste streams as feedstock. Furthermore, we are researching ways to translate an offshoot of the microbial fuel cell, the microbial desalination cell, to the food processing industry to enable water desalination via waste streams produced at these facilities.